Sounds like a bad romance novel but it’s not. Still, more dragons! Hadn’t heard of this before but we came across it at the LA Times Festival of Books. 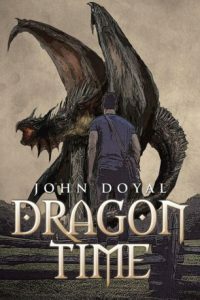 Dragon Time is a 2015 fantasy novel by John Doyal, published through Xlibris. “It started as a war between wizards on the planet Hector. Tulles wants change at all costs, and the Council of Wizards wants peace and stability. Add in two teenaged dragons stranded in world that they do not know and a group of orphans displaying signs of magic, and what do you have? The first war between nations in over two hundred years and the first war between dragons that this world has ever known.” Check it out over at Amazon.